Perfect for date night with your special someone! (SPOT.ph) February is definitely one of the busiest months for lovers of visual arts and theater. It is, after all, National Arts Month. So aside from the much-awaited Art Fair Philippines, it often marks the start of another frutiful theater season. It's also the perfect time to impress your special someone and surprise him/her with an art-filled date night. 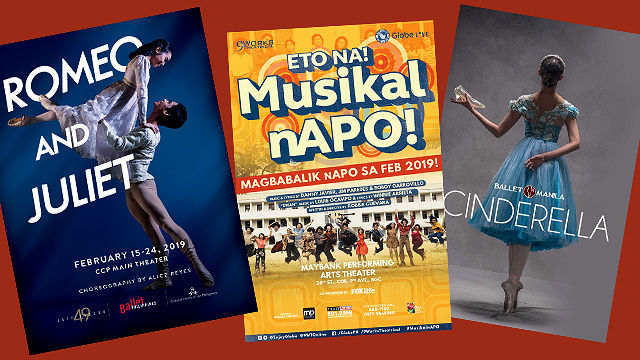 This February, we're treated to a variety of shows—from a one-woman play about a child's love for her mother to a musical about the love of a "phantom" for a woman he just met. Before the women's liberation movement emerged in the late 1960s, seeing women in the fields of science and engineering was unthinkable. So when one Henrietta Leavitt made her way from a small town in 1920s Massachusetts to the halls of Harvard College Observatory as more than a "human computer" but an astronomer herself, it immediately served as an inspiration to all. 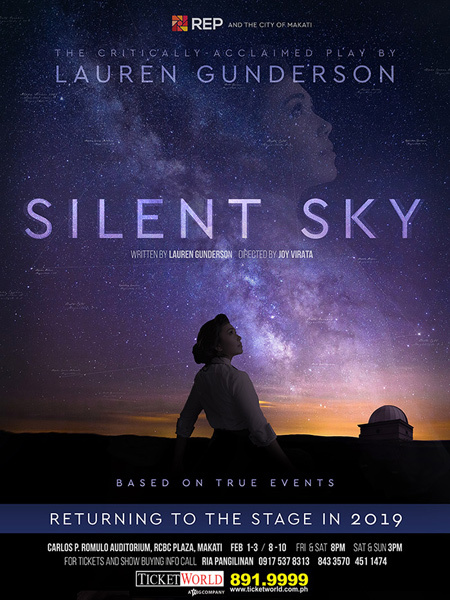 Lauren Gunderson's Silent Sky traces this journey of the woman who paved the way for the discovery of other galaxies. The show runs until February 10 at the Carlos P. Romulo Auditorium, 4/F RCBC Plaza, Ayala Avenue corner Gil Puyat Avenue, Makati City. Tickets, priced from P1,000 to P2,000, are available through Ticketworld. If you loved Margery Williams' The Velveteen Rabbit as a child, then you might want to check out Jay Crisostomo IV's Filipino adaptation of this well-loved classic. Follow this sweet stuffed rabbit as she tries to find love and her forever home. The show runs until February 16 at DITO: Bahay ng Sining, J. Molina Street, Marikina City. Tickets, priced at P400, are available through The Ikarus Theatre Collaborative's Facebook page. 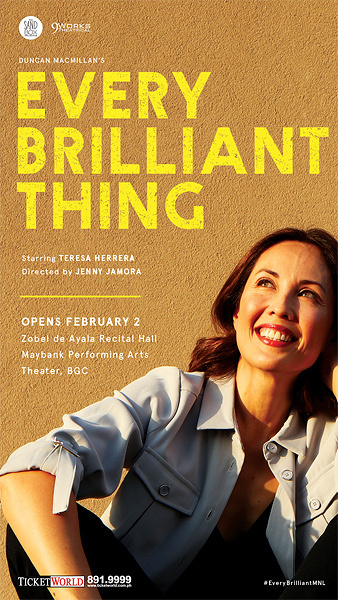 Actress Teresa Herrera and director Jenny Jamora join forces to bring to life Duncan Macmillan's Every Brilliant Thing. The one-character, 90-minute play (with no intermission!) takes us to the world of Angela, who starts listing down every brilliant thing that makes life worth living in an effort to cope with her mom's struggles with depression. Get ready to be part of the conversation as this humorous but moving play breaks the fourth wall. 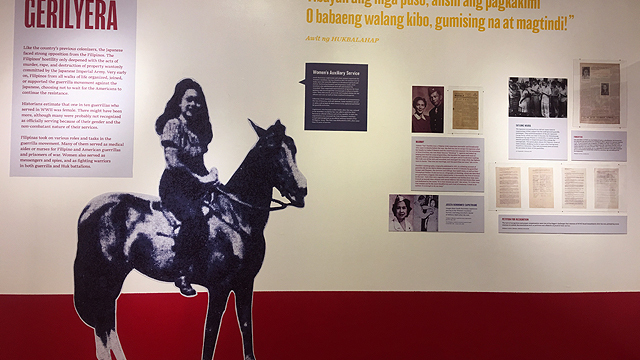 The show runs until February 24 at Zobel de Ayala Recital Hall, BGC Arts Center, 26th Street corner 9th Avenue, Bonifacio Global City, Taguig City. Tickets, priced from P1,000 to P1,200, are available through Ticketworld. Eto Na! 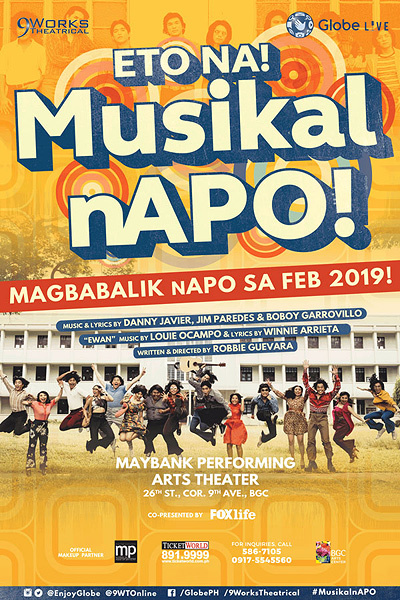 Musikal nAPO!, an all-original Filipino musical told through songs by Apo Hiking Society, returns to the stage in 2019 to bring us back to the '70s. 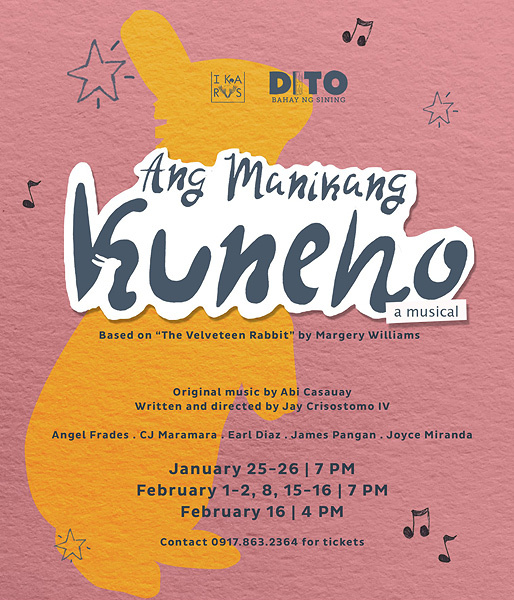 It follows the life of Jaime, Donnie, and Bobbie (yes, it's loosely based on the lives of Apo's members) as they try to win a songwriting competition while they weave their way through college, adulthood, and the dark years of Martial Law. The show runs until March 17 at Globe Auditorium, BGC Arts Center, 26th Street corner 9th Avenue, Bonifacio Global City, Taguig City. Tickets, priced from P1,500 to P3,600, are available through Ticketworld. Filipino comedian Jon Santos returns to the stage in celebration of his 30th anniversary in show business. 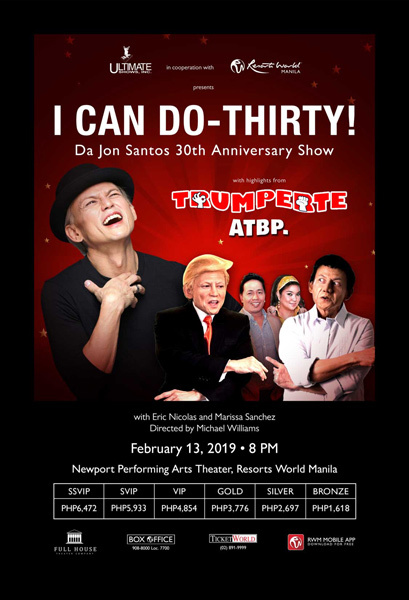 The standup comedy show features his satirical characters MACDonald Trump and Digong Duterthirty-HARI, as well as the actor's well-loved impersonations like Leila de Luna and Ferdie McCoy. It is co-written by Enrico Santos and Joel Mercado, and directed by Michael Williams. The show runs on February 13 at Newport Performing Arts Theater, Resorts World Manila, Newport Boulevard, Pasay City. Tickets, priced from P1,500 to P6,000, are available through Ticketworld. These days, it's easy to get away with bad behavior by claiming that everything's just a joke—or in the Pinoy colloquial term, charot. Philippine Educational Theater Association, in an aptly titled play, imagines the Philippines in 2020, when the nation is set to vote on a new charter that will establish federalism. Suddenly, bad weather hits the city and voters have nowhere to go and nothing else to do but debate on how the new system in question can affect their lives. Not much of a joke, is it? 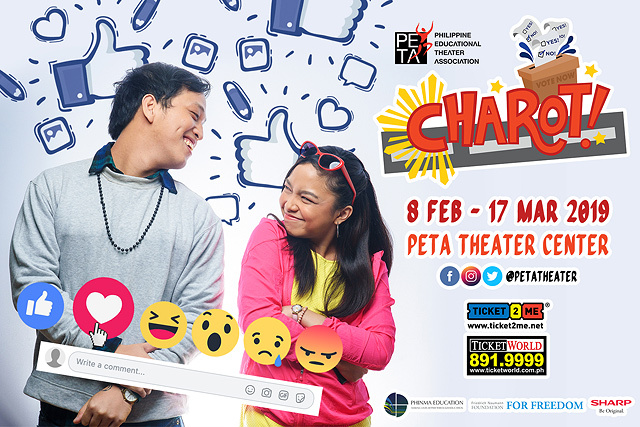 The show runs from February 8 to March 17 at PETA Theater Center, Sunnyside Drive, New Manila, Quezon City. Tickets, priced from P600 to P1,500, are available through Ticket2Me. 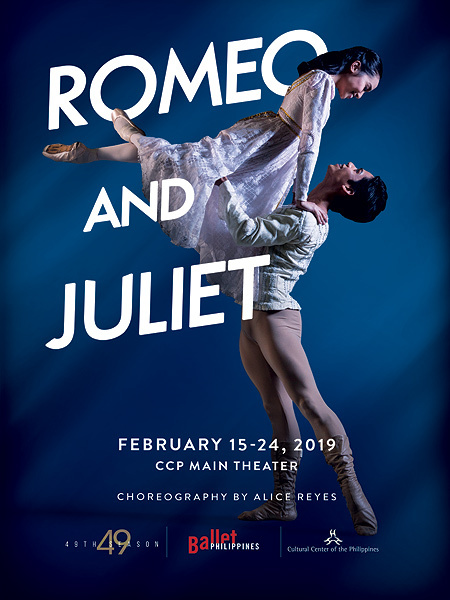 Ballet Philippines reimagines William Shakespeare's classic romantic tale between Romeo and Juliet—star-crossed lovers from feuding noble families. It is one of the dance company's most memorable pieces especially with the choreography by National Artist for Dance, Alice Reyes, and sets and costumes by National Artist for Theater and Design Salvador Bernal. Thirty-one years after the show was played in its entirety, Ballet Philippines is rebuilding Verona and presenting a new breed of talents, including Ronelson Yadao and Victor Maguad as Romeo and Monica Gana and Jemima Reyes as Juliet. The show runs from February 15 to 24 at Tanghalang Nicanor Abelardo, Cultural Center of the Philippines, Roxas Boulevard, Pasay City. Tickets, priced from P300 to P1,500, are available through Ticketworld. 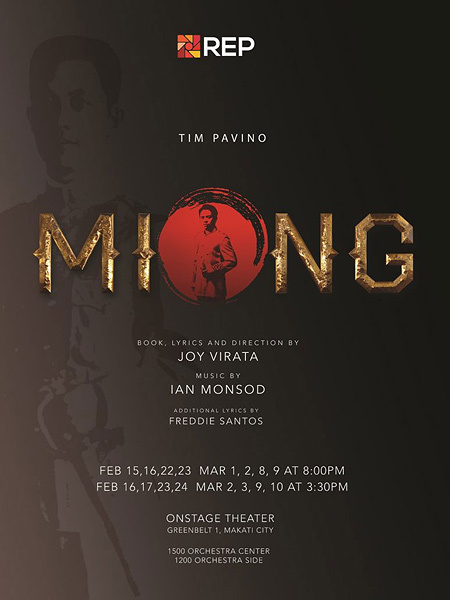 Repertory Philippines begins the year with a restaging of Miong, which tells the life story of Emilio Aguinaldo from his birth to presidency. First created in 1998 in time for the country's centennial celebration, this musical was written by Joy Virata with music by Ian Monsod. Tim Pavino headlines the show while Ejay Yatco serves as musical director. The show runs from February 15 to March 24 at Onstage Theater, 2/F Greenbelt 1, Paseo de Roxas Street, Makati City. Tickets, priced from P1,000 to P1,500, are available through Ticketworld. 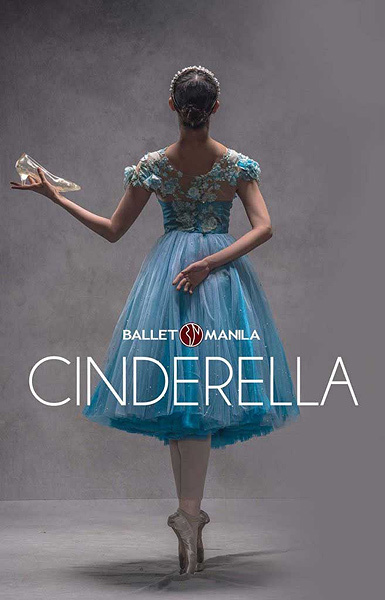 Cinderella, the first full-length choreography by Ballet Manila artistic director Lisa Macuja-Elizalde, returns to the stage after a successful premiere in 2016 and restaging in 2018. This is a fund-raising activity initiated by the Philippine Foundation for Lung Health, Research, and Development. The show runs on February 17 at Star Theater, Cultural Center of the Philippines Complex, Roxas Boulevard, Pasay City. Tickets, priced at P500, are available through Ticketworld. 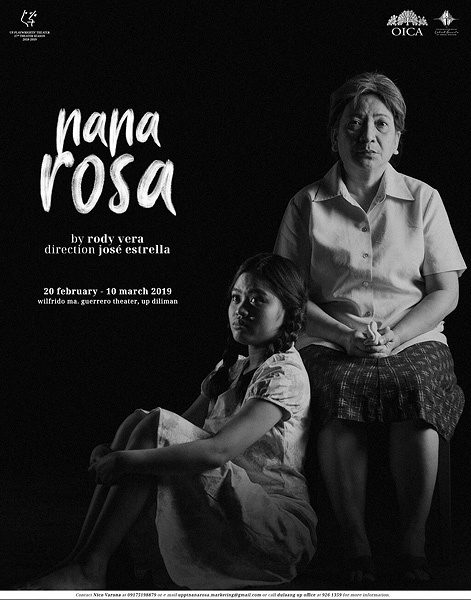 Nana Rosa, written by Rody Vera and directed by Jose Estrella, follows the life of Maria Rosa Henson—the first Filipina to publicly come out as a "comfort woman." Now more relevant than ever, it explores issues of women's rights, understanding history, and the atrocities of war. The show runs from February 20 to March 17 at Wilfrido Ma. 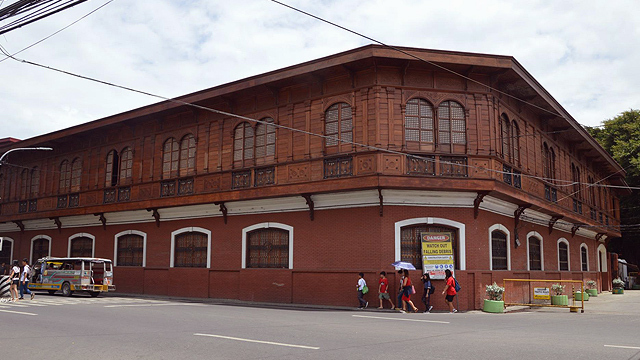 Guerrero Theater, 2/F Palma Hall, University of the Philippines - Diliman, Quezon City. Tickets, priced at P500, are available through Ticket2Me. 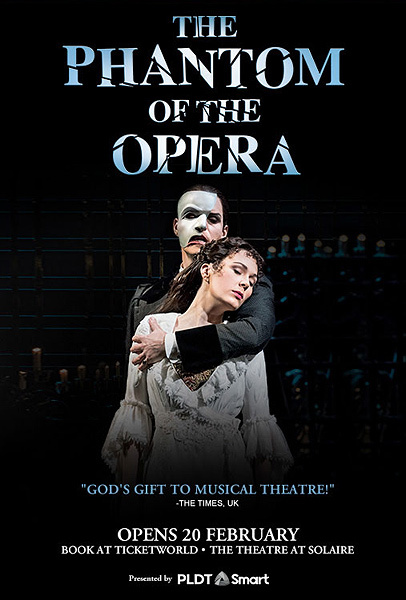 This year's much-awaited international musical is Andrew Lloyd Webber's The Phantom of the Opera. Get ready to tear up as you follow the story of the Paris Opera House's "Phantom" (Jonathan Roxmouth), who tries to get closer to vocalist Christine Daaé (Meghan Picerno). The young soprano, however, falls for arts benefactor Raoul (Matt Leisy). 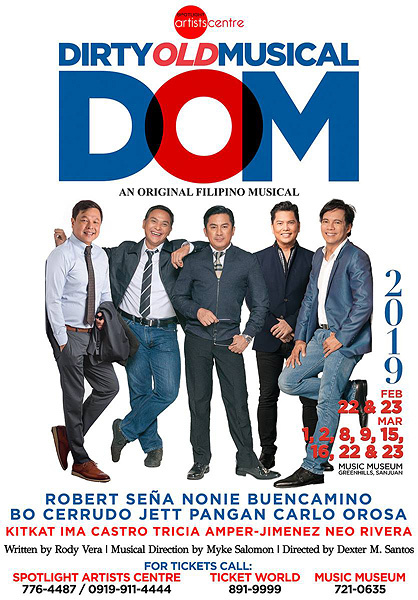 The show runs from February 20 to March 31 at The Theatre at Solaire, Solaire Resort and Casino, 1 Aseana Avenue, Parañaque City. Tickets, priced from P1,900 to P7,250, are available through Ticketworld. 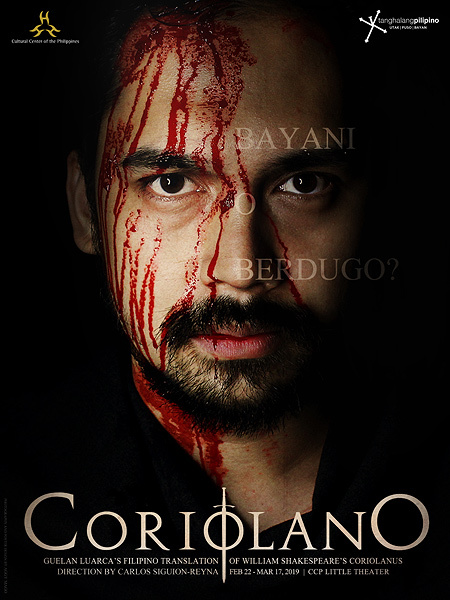 William Shakespeare's Coriolanus gets a Filipino treatment through the translation and adaptation of young playwright Guelan Luerca and direction of film veteran Carlos Siguion-Reyna. This tragedy is one of the best examples of the great bard's talent in producing a paradoxical and complex protagonist. Coriolano (Marco Viana) starts out as a brave and admired hero, but ends up a banished general because of his arrogance. The show runs from February 22 to March 17 at Tanghalang Aurelio Tolentino, Cultural Center of the Philippines, Roxas Boulevard, Pasay City. Tickets, priced from P800 to P1,000, are available through Ticketworld. Back by popular demand, Robert Seña, Nonie Buencamino, Bo Cerrudo, Jett Pangan, and Carlo Orosa rock the stage once again in a theatrical biopic of the fictional '80s male group band The Bench Boys. After being apart for some time, they have to do a one-time concert for an ailing member. Now in their 50s, the question is, can they still do it? The show runs from February 22 to March 23 at Music Museum, Greenhills Shopping Center, San Juan City. Tickets, priced from P1,000 to P3,000, are available through Ticketworld.